The 'Africanized honey bee' (A.m. scutellata), also known as the 'killer bee'. Because of the media attention received, Africanized bees have been given a bad name. This is not to say that they can’t be more dangerous than standard honeybees. They are highly defensive, they defend the colony in large packs often sending 100 – 300 guards to sting the intruder. Recently, several Mexican and Brazilian breeding programs have produced a more gentle hives of this race. This gentler and less swarm incline form of Scutellata has grown in popularity in regions of Brazil. Scutellata has proven to do very well in tropical areas, but do not winter well. These breeding programs are located in South America and import to the US is restricted. What is Africanized Honey Bee (AHB)? Why is AHB a problem? The way the AHB defends its nest is the main problem. AHB will respond to any threat to their nest and it does not take much for them to feel threatened. A person walking within 50 feet of a colony can trigger an attack. Operating power tools or power lawn equipment can trigger an attack from as far away as 100 feet. The AHB will respond in higher numbers than the EHB and more bees will sting the victim. AHB will chase a victim 1/4 to 1/2 mile and will remain agitated for an hour or more after an attack. This could cause a problem for someone arriving after an attack and walking into the areas where the agitated bees are. Sting for sting, the AHB is virtually identical to the EHB. The fact that more of them will sting a victim makes them more dangerous. How do the experts tell AHB from other bees? 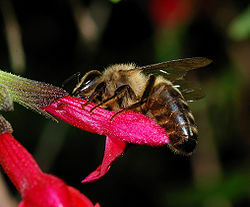 At the local level, a Fast Africanized Bee Identification System (FABIS) test can be performed. Starting with a sample of 50 to 100 bees, 10 bees are randomly sorted. The right wing is removed from each and mounted on microscope slides, and the average wing length is calculated. If the average wing length is over 9mm, the bees are European Honey Bees. If the average wing length is under 9mm, the bees are suspect Africanized Honey Bees. They are only suspect AHB because there are some Egyptian Honey Bees in the county that are a domesticated bee but are slightly smaller that the EHB. Some EHB are also slightly smaller than usual. The FABIS test is like the TB skin test. If the test is negative, you do not have TB. If the test is positive, you might have TB but need a more sophisticated test to be sure. If there is a need to know for certain that the sample is AHB or not, e.g., a multiple stinging incident or death, the sample is sent to the California Department of Food & Agriculture (CDFA) for further testing. They can perform either a DNA, or complete morphometrics test. The DNA test compares the DNA from the sample to known DNA standards to determine whether the bees are AHB or not. This test can be done on a small sample size but not if the bees were killed with certain pesticides. The chemicals used to kill the bees interfere with the test. Complete morphometrics can be used when the sample is contaminated with pesticides. Complete morphometrics is a series of very precise measurements of various parts of the bees in the sample. Some involve lengths of specific body parts, some involve the angles of wing veins. These measurements are then averaged and compared to a standard. A complete morphometrics test requires a larger sample size than the DNA test. Both tests are quite accurate and are considered the final word in AHB determination. 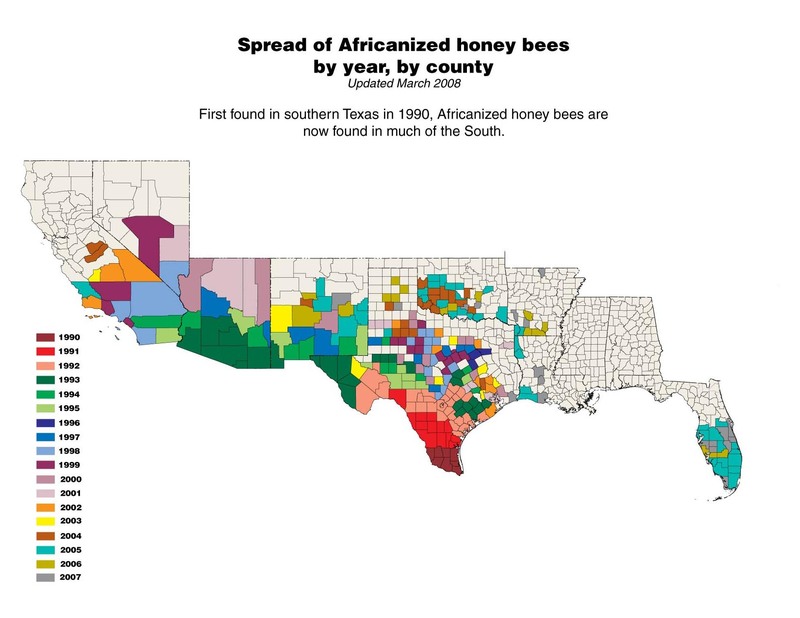 Where are africanized honey bees located in the US? Douglas Farm does not offer these bees as they are not easy to work with and they do not do well in our northern cold winters. The Russian honeybee from the Primorsky Krai, a region in the southern extreme of the Russian Far East, belongs to the species Apis mellifera. The Russian honeybee has evolved traits of resistance to natural mites owing to heavy selection pressures. It has lived for more than 150 years in a region that is home to the varroa mite and the tracheal mites (Acarapis woodi). In 1997, the USDA's Honeybee Breeding, Genetics & Physiology Laboratory in Baton Rouge, Louisiana imported Russian bees to North America. The Russian bees are a dark bee with more grey than yellow when compared to the Carniolan strain. They use less propolis than typical Italian honey bees. The bees show exceptional winter hardiness, smaller clusters, and produce a decent nectar haul per bee. Douglas Farm does not offer them. We have found them more prone to building queen cells, more prone to swarming, keep smaller populations even during peak flow, and about the same as carniolans for calmness. Should you be interested in getting Russian bees contact a local member of the Russian Breeders Association. There are atleast 14 members, and they have their genetics tested and verified for unique Russian dna markers. The Caucasian honey bee is said to originate from the high valleys of the Central Caucasus Mountains. Georgia beekeepers claim this is unfair. 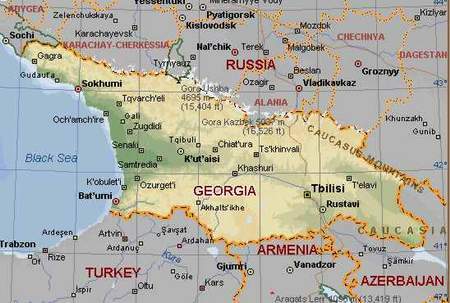 They state, exploration of bee species in Caucasus and their denomination basically took place in times when Georgia was part of Caucasus under the Russian Empire. This was the reason the species was denominated as Caucasian instead of Georgian Bee. The high use of propolis may be seen as undesirable as it makes hive management more difficult. Frames and hive boxes are glued together more substantially. These have local variants, such as the Pomeranian Brown, the Alps Black, or the Black Scandinavian. All of the subspecies belong to the 'M' lineage of Apis mellifera. Availability in the US is minimal as most beekeepers switched to the Italian bee (mellifera ligustica) during the 1800’s. Most likely as beekeepers started to use the Italian bee the genetic lines of the German bee and the Italian bee merged to create the bee we know today as Italian here in America. John Harbo, an ARS (Agricultural Research Service) entomologist who studies the parasite, says, “Varroa mites have caused devastating losses to bee colonies, contributing to concerns over a bee shortage in the last year.” Frustrating beekeepers’ defensive measures is the mites’ growing resistance to commercial pesticides. But Harbo and fellow entomologist Jeffrey Harris, who work in ARS’s Honey Bee Breeding, Genetics, and Physiology Research Unit at Baton Rouge, Louisiana, have found a natural, more lasting antidote to the mite problem: breeding genetically superior bees. They have specially selected bees with a “nose” for tracking down Varroa mites—and not just any Varroa, but those producing and rearing new generations of mites. Harbo and Harris have closely studied Varroa mites’ reproductive cycle and activities. Harris has even gone so far as to glue flecks of craft glitter onto female mites to visually track their movements and fate within a bee colony. So the two were thrilled 9 years ago when they thought they’d discovered a trait in bees that could keep individual mites from reproducing. They called this trait “SMR” for its apparent ability to suppress mite reproduction. (See “SMR—This Honey of a Trait Protects Bees From Deadly Mites,” Agricultural Research, May 2004.) When SMR bees were introduced into a colony, Harbo and Harris would watch numbers of mite offspring plummet. Since 2001 the USDA has been distributing their VSH breeding stock through a Cooperative Research and Development Agreement (CRADA) with Glenn Apiaries, a commercial queen breeding company utilizing instrumental insemination to propagate pure VSH breeder queens. Now many hundreds of these breeders have been sent around the country and many thousands more of daughter queens have been propagated and installed in beekeepers hives around America. Douglas Farm has not chosen to add this stock to their lines yet. Mainly we choose to do this because we believe any genetic stock can be hygenic and gentile with the proper testing, parental selection and breeding methods. It is not nessisary to create hybrids to bring out desired bee behavior. Each of our availible stocks are truely unique. During queen mating we use isolated mating yards and plan to add artificial insemination in a few years. There are many variations of the Italian and Carniolan. There are a number of breeders who feel their Italian has shown supirior to other, and thus name them as if they were their own breed. Some would ask is this just a marketing ploy? Many producers of these use uncontrolled natural mating and genetic stock is uncertain. Some breeders assume that mixing two stocks automatically results in the best of two breeds coming together to make a super powered hybrid. If it's to good to be true it ususally is. There is no short cut for proper breeding methods. Thus Douglas Farm does not offern these hybrids. Starline - Italian hybrid - marketed for its vigor and strong honey production. All-Star - Italian hybrid - marketed for its vigor and strong honey production. All American - Italian hybrid - marketed for its vigor and strong honey production. Kona Queen - Italian hybrid - Hawaiian Italian or Cordovan bee marketed for its strong honey production in warm climates. Several reports of low mite resistance. Cape Bee (Apis mellifera capensis) - Workers can lay nonproducing clones.